NY FASHION WEEK FOR SPRING 2019: ENOUGH ALREADY! Off-and-running at New York Fashion Week! Too much, and it’s already fashion overkill. Too many shows and presentations. New names galore, but who are they? Tom Ford’s elegant, glamorous collection is for immediate fall selling-and-wearing, whereas most shows previewed spring ’19. As expected, the hit of the week was Ralph Lauren’s 50th anniversary celebration. Same stuff, but it’s always on the mark. What’s new? Absolutely nothing. Nada. Maybe we don’t need newness. Even seasoned fashion professionals are challenged by the current stagnant state of style. 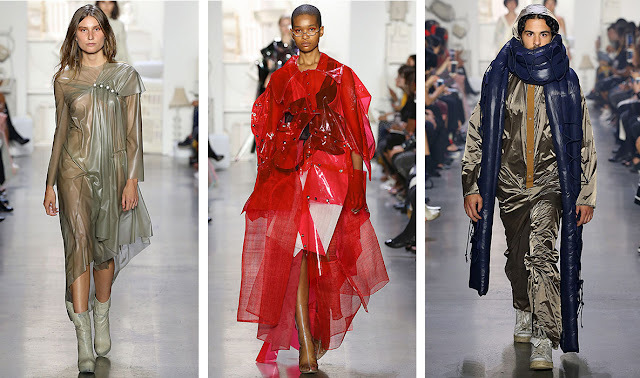 Marilyn Kirschner of “Lookonline.com,” one of the brightest fashionistas, with years of authoritative reporting, told the honest truth about New York Fashion Week. Here’s what she said:. 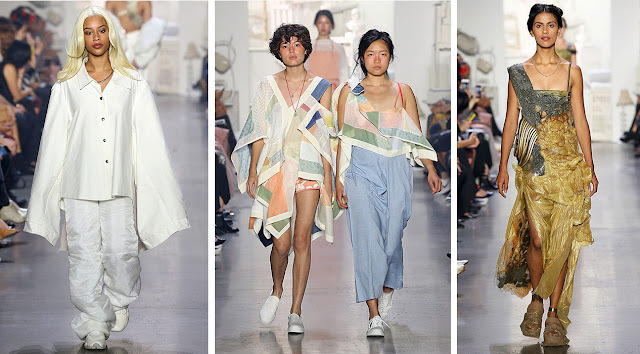 “…themes and subthemes that kept reappearing were strong vibrant color and color blocks, head-to-toe white, yellow, lace and lingerie touches, fringe, pleats, luxe boho, florals, stripes, choir robe gowns, denim, tailoring, shirt dressing, pantsuits, tie-dye, romanticism, cross-cultural references, prairie looks, trench coats, caftans, pointy-toed pumps, crochet, photo prints, cargo pockets, face art, shifts, volume, oversized, etc. But just listing trends robotically is boring and irrelevant, and anyway, when are these items above ever ‘out’ of style?...” I agree with her, 100%. If indeed fashion is nothing more than a melting pot of virtually any old thing, it will take a savvy shopper to recognize the “must-haves” of the season. Start with happy-go-lucky colors, especially more rosy pinks, yet spotlighting yellow as the “it” hue. White is the popular fail-safe neutral, ever fresh and often lacy. 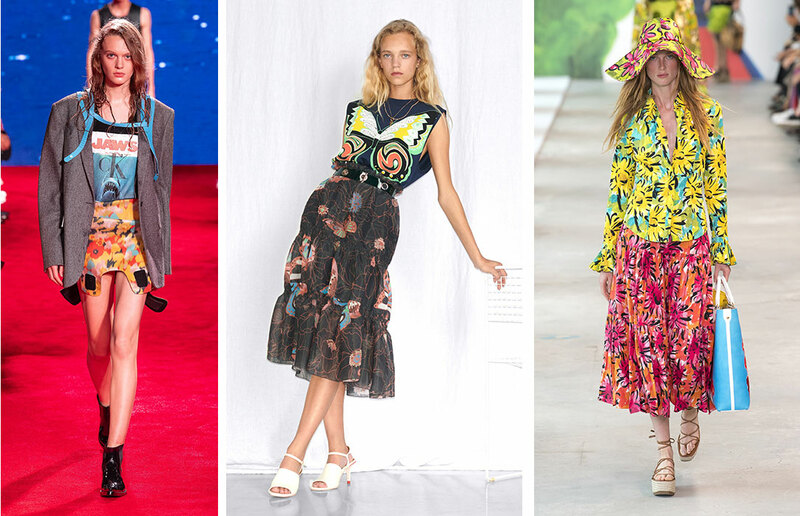 Prints abound as vaguely ‘60s flowers bloom again. Shirts are a continuing success story. Is it too obvious to recognize that the Feminist Movement may be responsible for the reinvention of the pantsuit? 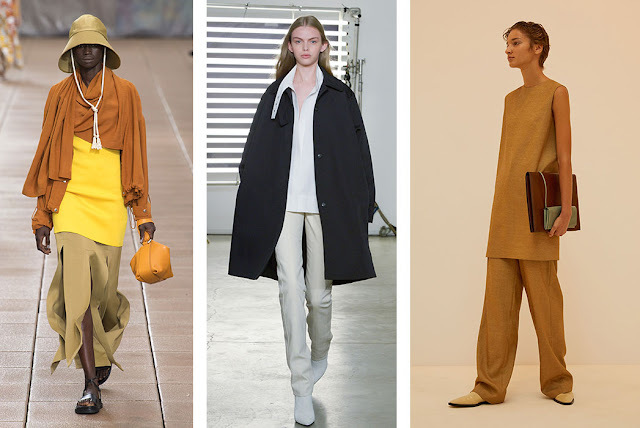 If you must have a trend, think about modernized, simplified ethnic, relaxed sportswear separates. 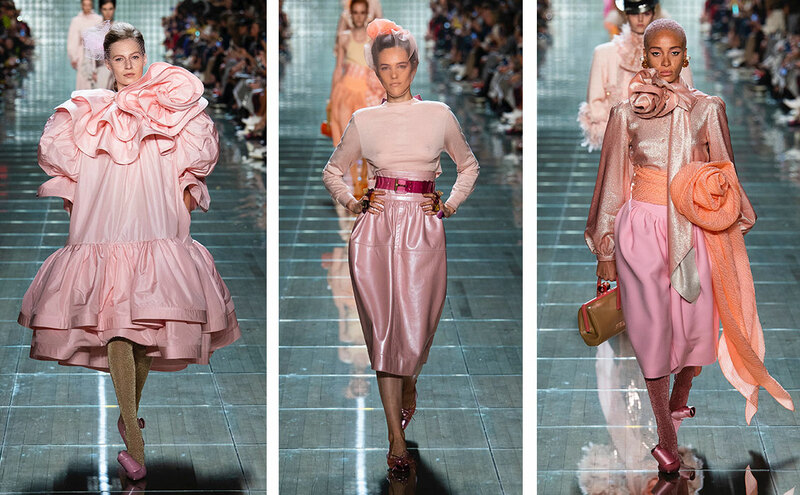 For pure fashion with a capital “F”, look no further than Marc Jacobs’ somewhat satirical and certainly ridiculous overstated tribute to Yves Saint Laurent pushed to the extreme. 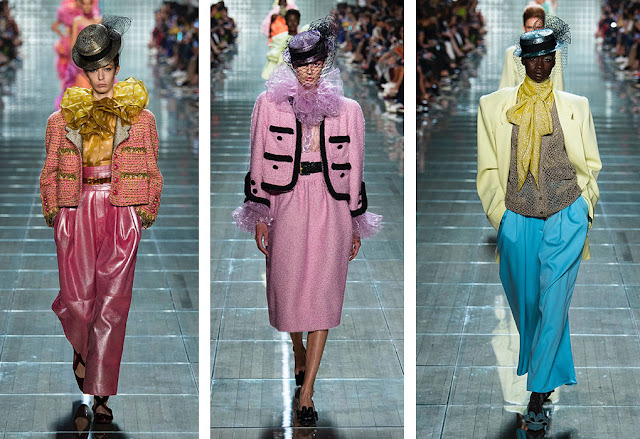 Wonderful YSL color combos, but as Looney Tunes used to say… that’s all, folks! 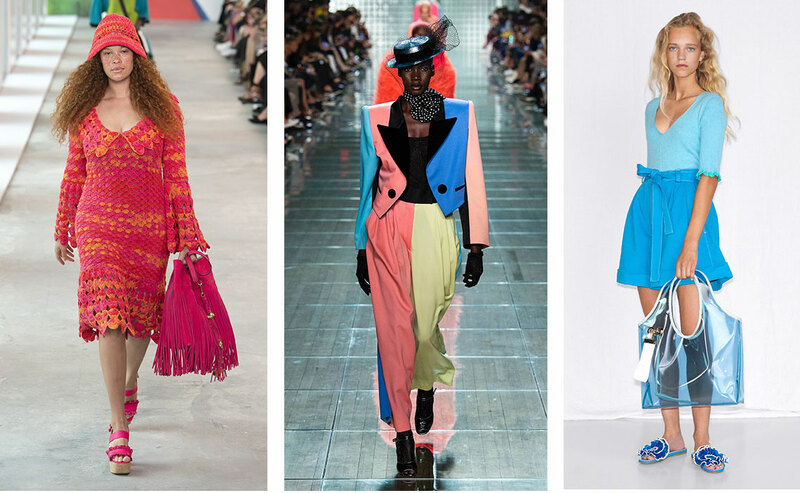 Happy-go-lucky optimistic colors from Michael Kors, Marc Jacobs and See. Continuing the mash-up mixes from Calvin Klein, See and Michael Kors. Lacy textures in white from Carolina Herrera, Michael Kors and another Michael Kors. Easy pieces add up to make a modern statement from Philip Lim, Narciso Rodriguez and Theory. 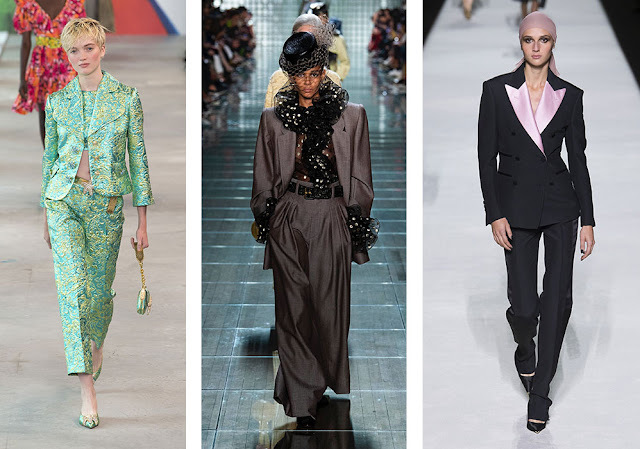 Pantsuits with feminine flair from Michael Kors, Marc Jacobs and Tom Ford. Marc Jacobs correctly thinks pinks are still coming up rosy. 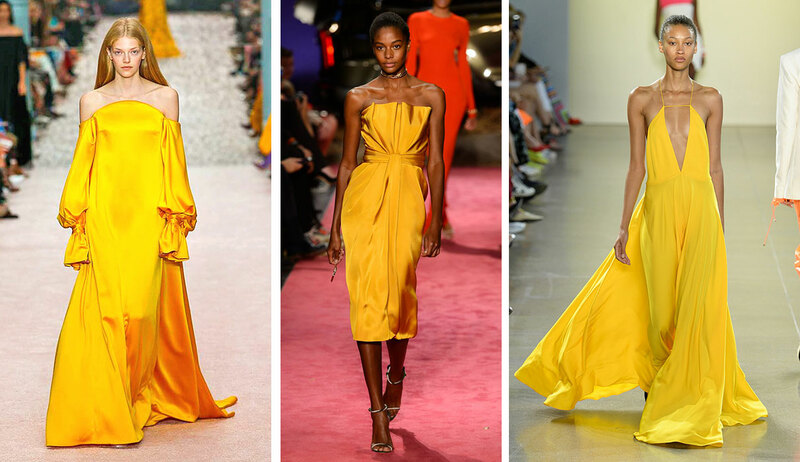 Sunshine bright Mellow Yellow from Carolina Herrera, Brandon Maxwell and Milly. YSL-style pushed to almost comic extremes by Marc Jacobs. Tom Ford’s elegant, buy-now/wear-now sophisticated statement. The recent passing of brilliant artist/illustrator/designer Michaele Vollbracht at age 70 represents the loss of a great talent. 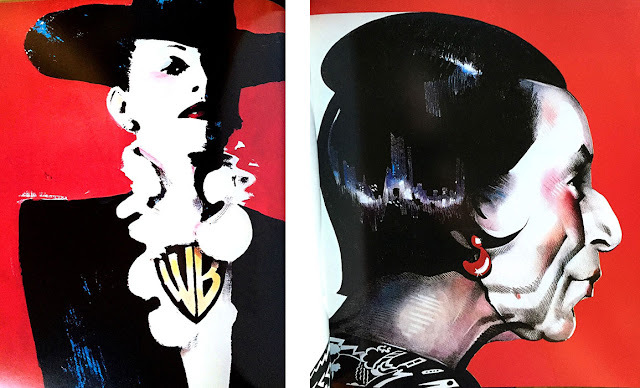 A 1969 graduate of Parson’s School of Design, he brought cinematic glamour to fashion illustration as well as very sophisticated apparel design. However, his business acumen did not match his creativity. His illustrations captured the essence of glamour, and he explained, “I owe my talent to American films.” Joan Crawford became a close friend and Elizabeth Taylor was a client. Vollbracht worked for Henri Bendel and Bloomingdale’s, achieving fame when a shopping bag he designed with a stunning face failed to carry the store’s name, an error unnoticed before 9 million bags had been printed. The bags were deemed chic and became highly collectible. He started his own apparel company in 1978 and was immediately recognized as a star. His signature designs were unique, flamboyant prints on silk and were coveted by celebrities. In1985, he published “Nothing Sacred,” a collection of glamorous and witty illustrations that was reprinted a few years ago. In 2003, he took on the formidable task of designing the Bill Blass collection but not for long. The deal ended in 2007. During the last decade, he dropped off the fashion radar and devoted himself to serious painting. Michaele Vollbracht’s life and talent were recently honored and celebrated in a memorial evening at Parson’s, his alma mater. 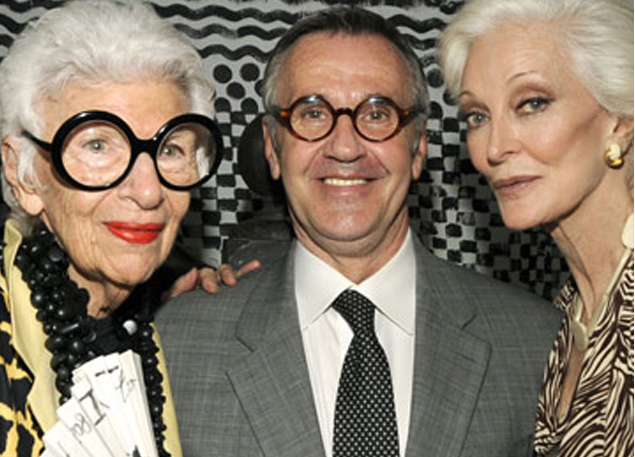 Michaele with Iris Apfel and Carmen. Flamboyant fashions and that famous shopping bag. The 70th year of Emmy Awards played to a stadium-size auditorium and the only exciting thing to happen was a surprise marriage proposal on stage. The rest of the super-slick show was as expected (Boring? You bet!). Hundreds of categories became mind-numbing and meaningless. RuPaul took home five statuettes. Ho hum. The traditional red carpet was replaced with a gold carpet. (Double ho-hum.) The gowns were better than usual, although representing very inconsequential trends. There was a selection of colors; primarily red, a few pastels, a whole lot of white and a smattering of black. The go-for-glitz sparkling styles were yawn-inducing, so expected. Unembellished gowns looked refreshing. My favorite was Claire Foy’s Calvin Klein ankle length white column with a lily-petal ruffle in the back. Her hair was notable too, a short, sleek boyish bob. A few stars went to extremes with tricky trims and very high fashion statements. 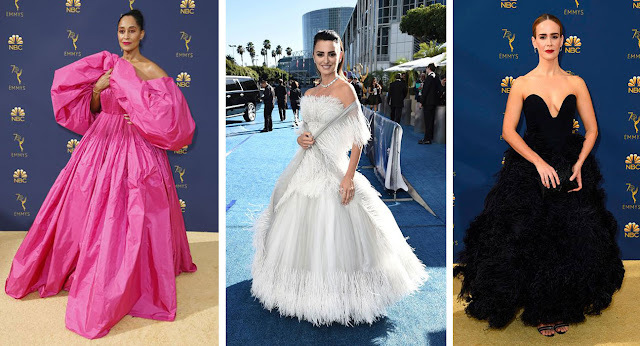 Tracee Ellis Ross wore a huge hot pink balloon by Valentino, Sarah Paulson channeled a black swan in Oscar de la Renta and Penelope Cruz floated in wearing frothy feathers by Chanel Haute Couture. If anybody believed that the fashion industry is influenced by the celebrity carpet, red or gold, they better think again. Extreme Haute Couture on Tracee Ellis Ross, Penelope Cruz, Sarah Paulson. Starstruck white on Claire Foy. Scarlett Johansson and Jessica Biel. 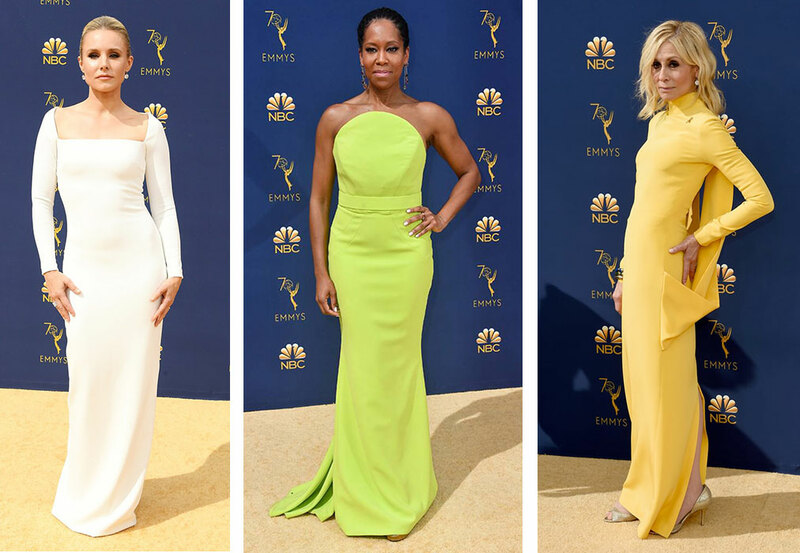 Unembellished simplicity on Kristen Bell, Regina King and Judith Light. Yawn-inducing same old sparkle on Constance Wu, Chrissy Teigen and Allison Janney. Classic Hollywood goddess glamour on Elizabeth Moss, Kirsten Dunst and Heidi Klum. 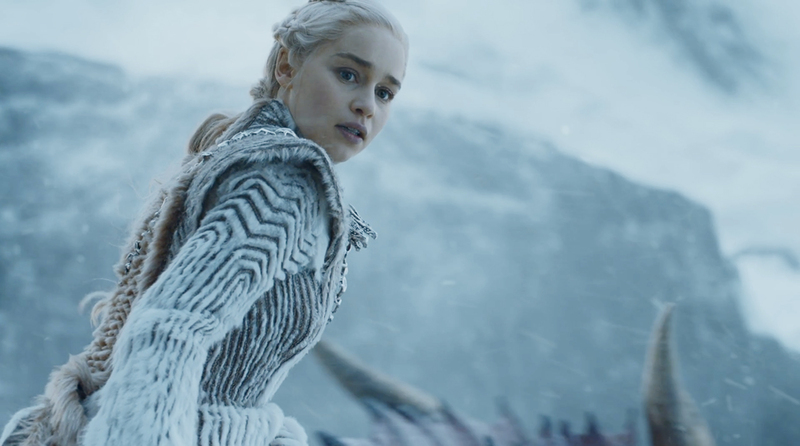 There are now four categories for costume design Emmys and that means the winners can make sense. After all, RuPaul’s dressed-to-thrill Drag Race should not compete with The Crown’s Queenly ‘50s garb, nor should the primitive fantasies beyond the wall in Game of Thrones. And how about the Gianni Versace deluxe glam that’s being revived right now? 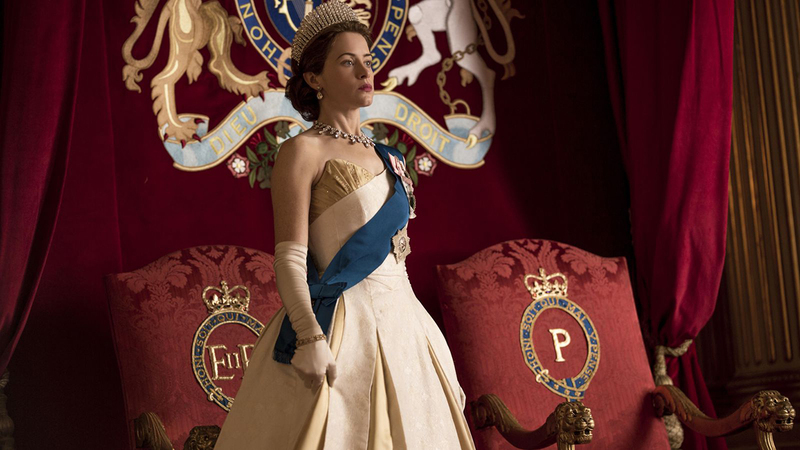 All four of these fab TV shows were creatively costumed and deserved an Emmy. They all won! Contemporary Category: The Assassination of Gianni Versace; American Crime Story. Fantasy/Sci-Fi Category: Game of Thrones. Non-Fiction Reality Competition Category: RuPaul’s Drag Race. The 2018 Paper Doll Convention held in Seattle will long live in my memory. It was like a big extended family reunion party. Both “Paper Doll Studio” magazine and “Paperdoll Review” magazine feature fully detailed reports of the July “Entertainment Extravaganza.” Responsible for the great success of the Convention was the exceptionally talented husband and wife team, Sharry O’Hare and Micheal O’ Hara. They are very active in community theatre, understandably so. They are special people and I deem myself lucky to have them as special friends. 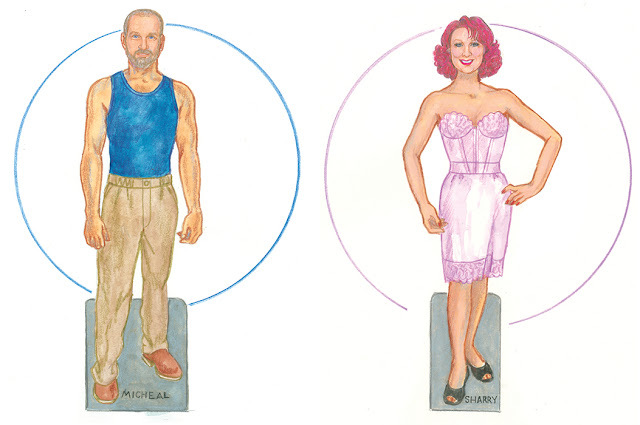 As a token of my appreciation, I created special one-of-a-kind paper dolls of Sharry and Micheal with a few costumes from shows they have starred in, including: Take Me Long, Man of La Mancha, Gypsy, A Little Night Music, 1776 and Seussical. 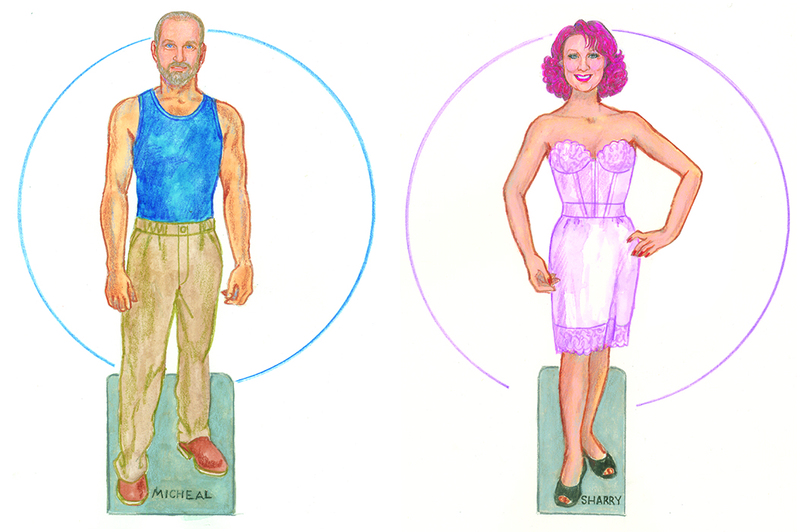 Paper Dolls of Sharry and Micheal. Sharry and Michael in some of their favorite costumes. 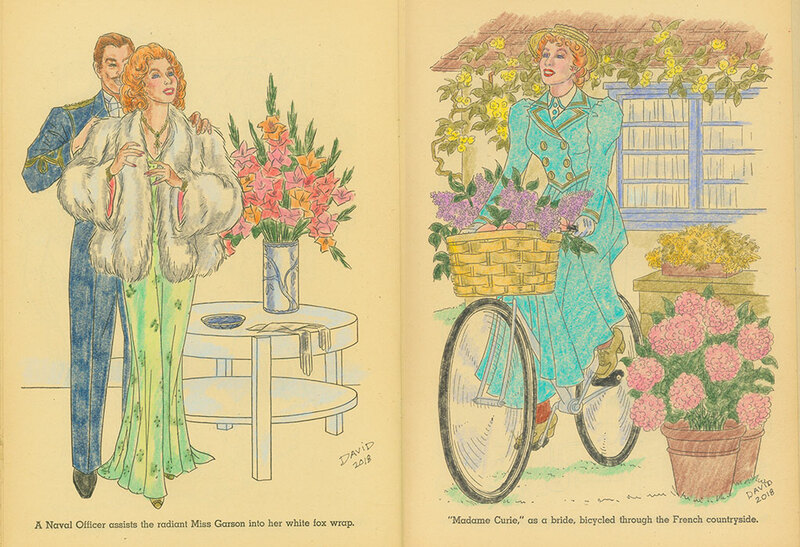 Continuing my monthly coloring book fun, I again opened my favorite book, “Greer Garson,” published in 1944 and now softly yellowed with age. It’s beautifully drawn and a joy to bring to life with colored pencils. Many costumes from Greer’s hits inspired marvelous artwork. I am surprised that such a great star is not often given her due in Hollywood history though TCM often shows her many films. Let’s remember her; M-G-M’s great lady star. A titian-haired British beauty, she reigned as Hollywood’s most popular leading lady during the years of World War II. Greer Garson’s film stardom started late when M-G-M mogul Louis B. Mayer saw her onstage in London and offered her a contract. She was already in her mid-thirties when she arrived in Hollywood where at first it was difficult to cast her. Initially, she was made-up like a doll with tight curls but after an M-G-M make-over, her regal beauty, splendid intelligence and gracious demeanor revealed her stunning star quality. Wartime audiences responded to her aura of heartfelt warmth and calm elegance. Her first film catapulted her to stardom and an Academy Award nomination for Best Actress in 1939’s Goodbye Mr. Chips. Hit followed hit and peaked in 1942 with Mrs. Miniver starring Greer Garson in the role of her lifetime as the brave wife and mother coping with the Blitz. The film was lauded by President Franklin Delano Roosevelt and Prime Minister Winston Churchill and garnered Greer the Best Actress Oscar and the longest acceptance speech in Hollywood History. Her career continued with great success until 1946 when the war ended and the movie industry sought a fresh approach that no longer included so-called “women’s pictures” such as sentimental romances that called for great lady stars including the incomparable Greer Garson. 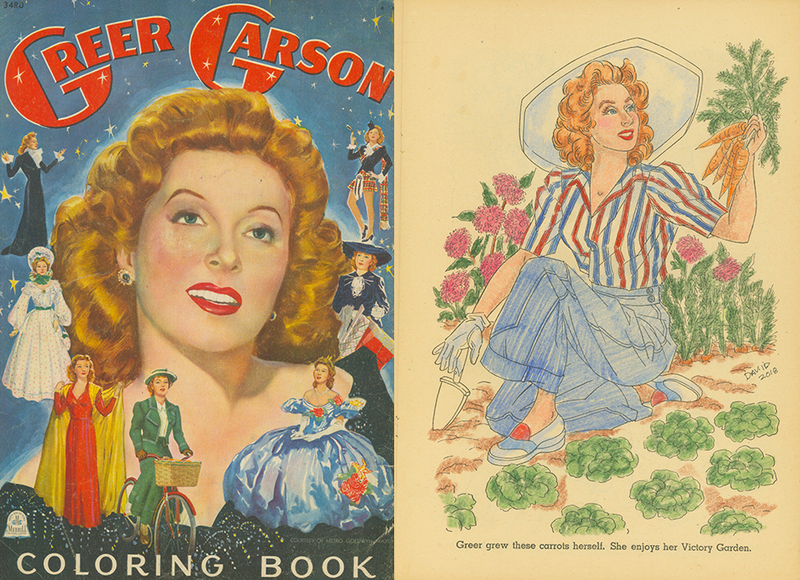 Greer Garson 1944 coloring book cover and Victory garden. '40s evening glamour and a scene from ”Madame Curie,” colored by Me. 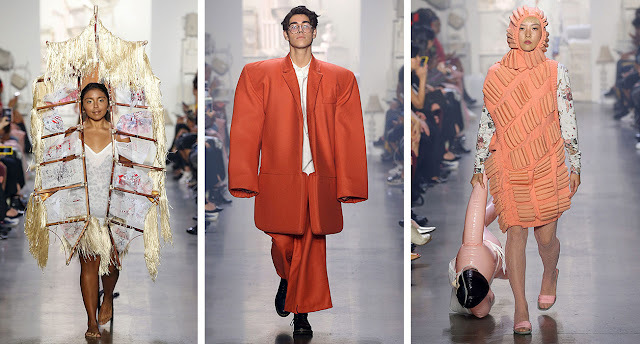 The Rhode Island School of Design, RISD, is one of the most highly respected arts colleges in the world but I fear that their fashion viewpoint is just too creative to be meaningful. High concepts ruled this year’s Grad show and were described thus: “Oversized design to distort silhouettes…abstraction of tailored suits…in-between genders…Mexi-witchery.” Take a look at some runway train wrecks at the recent show. Is this the future of fashion? I sure hope not. Maya Ortiz, Erika Kim and Yufei Liu. Fernando Flaquer, Ying Bonny Cai and Michaela Wong Xing Yi. Rachel Wong, Zehua Crystal Wu and Matthew Streedy. 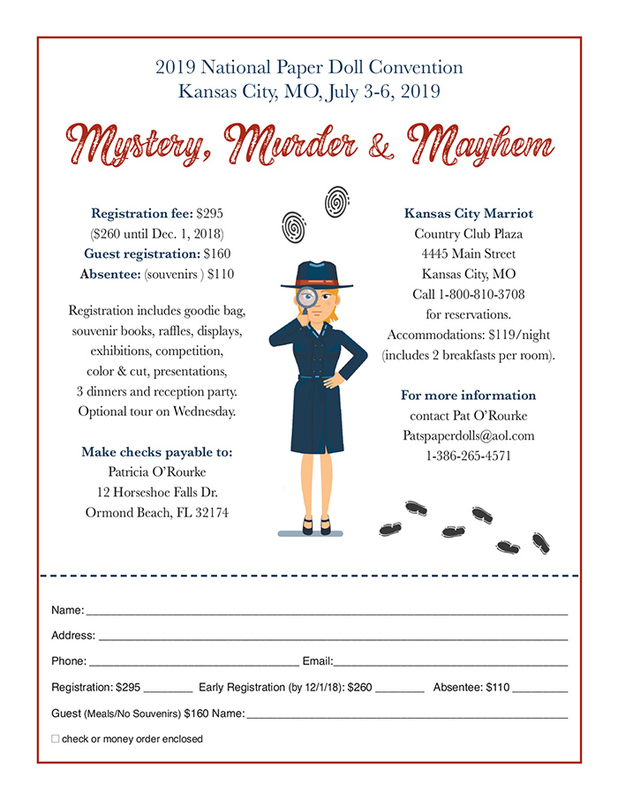 JOIN US AT THE 2019 PAPER DOLL CONVENTION! The 2019 Paper Doll Convention is scheduled for July 3-6, 2019, in Kansas City, MO. 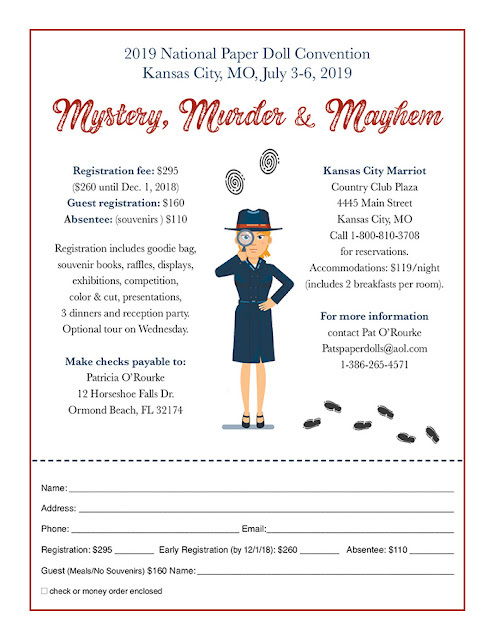 Hosted by Pat O'Rourke, with the Mystery, Murder & Mayhem, it's sure to be a good time! Visit OPDAG's convention info page for details. Thank you so much for the wonderful review of Fashion Week! Great reference material. I appreciate all the work you do for all of us in the paper doll artist and collector world. David, I'm just now getting to read this, your most recent blog. I don't follow a lot of the fashion shows as you do but from what you've shown and wrote via photos and text does make me wonder about the creativity that's being exhibited. The fashion scene is suffering from being out of focus or not focused and not really making statements or whatever. Anyway, I enjoyed your comments on the subject. Greer Garson, just a truly lovely actress. I only saw her star in two movies: Goodbye, Mr. Chips and Mrs. Miniver and in the latter I can see why the President and the Prime Minister enjoyed the movie. It was riveting. I'm happy for you that you can enjoy her coloring book. I do have adult coloring books and when I get a minute or two, I enjoy coloring but there's something about a kid's coloring book: the drawings, how they often seem to drawn you in; the paper quality which works best with crayon or colored pencil; and sometimes the theme of the book itself is inviting and encourages the colorist to be mindful of certain details that pop up in several drawings: hair style and color, certain jewelry, clothes that are repeated in different scenes. I personally enjoy using crayons in the type of coloring book you have of Greer Garson but I prefer colored pencils in the adult coloring books and black and white paper dolls. I meandering here..... Love your post. Have a great day! Greer was such a lovely, classy woman, a perfect role model for the WWII years. The world could be a better place if there were some similar role models for young women to follow today. I don't think Cardi-B (the rapper) and other Instagram-type contemporary celebs are good role models. The world has turned sour, I guess.